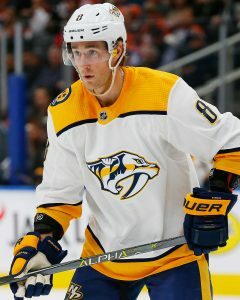 After exiting Friday night’s game following a bit hit from Brayden Schenn, Nashville Predators forward Kyle Turris has been placed on injured reserve. The team has recalled Rocco Grimaldi from the AHL in his place. Turris will be forced to miss at least the next three Predators games, though no update has been given on his timeline. The Predators were dismantled by the St. Louis Blues in Friday’s game, with Juuse Saros allowing five goals on 15 shots before giving up the net. Nashville will be looking to get back into the win column tonight when they welcome in the Anaheim Ducks, but will now have to do it without another one of their top players. The team is already missing Viktor Arvidsson and P.K. Subban, meaning they’ll have to rely on some of their other talents to carry them through the next little while. Up front, even more responsibility will likely be heaped onto the shoulders of Nick Bonino, who has been a stalwart defensive presence fr the team but has just three goals and nine points on the year. The 30-year old forward hasn’t had quite the impact that was expected when he signed a four-year $16.4MM deal in 2017 but will get an opportunity to show he can step into an offensive role while Turris is out. Colton Sissons has also seen his role increased recently, playing a season-high 20:19 just a few days ago against the Los Angeles Kings. Grimaldi meanwhile has played six games for the Predators this season but has just one goal to show for it, instead doing most of his damage at the minor league level. The 25-year old forward has been used in spot duty throughout his career, suiting up just 43 times since signing out of the University of North Dakota in 2014. An extremely talented offensive player, Grimaldi is held back—or perhaps overlooked—at times due to his small 5’6″ frame. The Nashville Predators watched the rest of the league throw money at many of the free agents available earlier today, but now have a few signings of their own. Connor Brickley, Rocco Grimaldi and Jarred Tinordi have all signed one-year two-way contracts worth $650K at the NHL level, giving the organization several excellent minor league players that have NHL experience. The Canadian Olympic team got off to a better start than their US equivalent, beating the Swiss team 5-1 in their opening game this morning. Wojtek Wolski and Rene Bourque both tallied two goals in the win, showing that they still have some high-level hockey left in them after a long professional career. As the Olympics continues, we’ll keep track of all the NHL’s minor transactions right here. The Ottawa Senators have recalled Ben Harpur from the minor leagues, giving them an extra defenseman for their game against the Buffalo Sabres later tonight. Harpur was recently extended by the team for two more years, as he obviously figures into their plan on the blue line. The 23-year old has a single point in 20 games with the Senators this season. Brendan Lemieux has been loaned back to the Manitoba Moose of the AHL. The Winnipeg Jets are preparing for their matchup tomorrow against the Colorado Avalanche, and have several players nursing injuries. Lemieux has played very well for the Moose this season, recording 28 points in 30 games and has made a physical impact during his nine games with the Jets. The 21-year old is part of the future in Winnipeg as a bottom-six winger who carries some scoring upside. Reid Duke has been activated from injured reserve and sent to the Chicago Wolves, finally ready to start his professional career after being the first player ever to sign with the Vegas Golden Knights. Duke was injured in training camp and hasn’t played all season. While many have expected the Avalanche to deal center Matt Duchene with him being in the rumor mill dating back to last season, some general managers around the league now believe that GM Joe Sakic is trying to convince Duchene to stick it out in Colorado, TSN’s Darren Dreger reported on a segment with WGR 550 in Buffalo (audio link). Duchene’s preference to be dealt has been well-known for a while now so on the surface, it would feel like a longshot for the team to convince him to rescind his trade request now after everything that has transpired; Dreger adds that he still expects a trade to happen at some point. Assuming Sakic could persuade him to stick it out with the Avs, Duchene still wouldn’t be able to sign a contract extension until July. Despite his unhappiness with his situation, Duchene is off to a nice start this season with eight points (3-5-8) through ten games which have him tied for the team lead with blueliner Tyson Barrie. That will certainly allow Sakic to keep the asking price as high as it has been dating back to last season and afford him the time to try to convince Duchene to have a change of heart if that is indeed the route they’re now trying to go. Winger J.T. Compher is two-to-three weeks away from returning to the lineup as he continues his recovery from a broken thumb, head coach Jared Bednar told BSN Denver’s Adrian Dater. The 22-year-old continues to skate daily which should help in terms of conditioning when he gets the green light to return. In eight games this season, Compher has a goal and three assists while averaging a little over 15 minutes per night. Compher’s replacement now finds himself banged up as well as winger Gabriel Bourque suffered an upper-body injury last night, notes Betsy Helfand of the Denver Post. He left Friday’s loss against Vegas in the first period and did not return. Alexander Kerfoot also left the game in the third period. Bednar didn’t have an immediate update on either player. With those two injuries, the Avs announced (Twitter link) that they’ve promoted forwards Rocco Grimaldi and Andrew Agozzino from AHL San Antonio. The undersized Grimaldi has seen NHL action in each of the last three seasons while Agozzino is their top scorer at the minor league level with eight points through the first seven games of 2017-18. To make room for them on the roster, Mike Chambers of the Denver Post reports (Twitter link) that Bourque and Colin Wilson have been placed on IR.